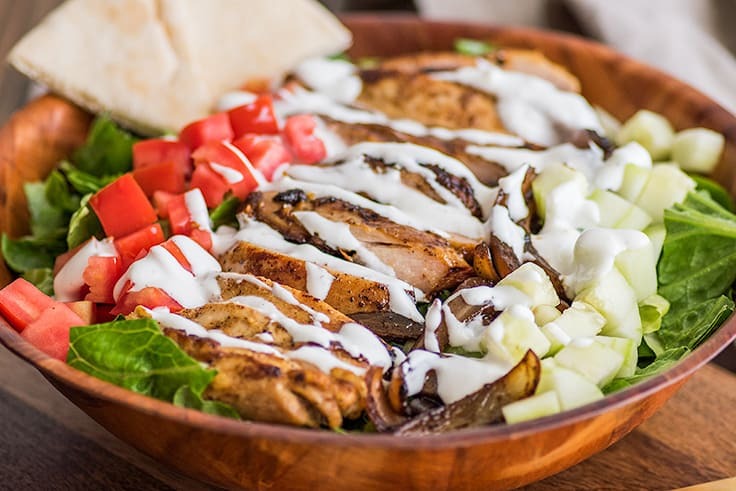 Chicken Shawarma Salad: tender and juicy marinated chicken thighs served up on a bed of crispy romaine with tomatoes, cucumbers, and red onions, topped with a quick and easy creamy yogurt dressing. It’s been a while since I last posted a salad recipe. The last one was in *goes to look it up* holy cow, January 2016. The reason for the lack of salads is that even though I love them, salad recipes just don’t do that well on the site. They’re consistently some of my least popular recipes in terms of traffic. BUT I figured it was time to give salad another go because I’ve been making today’s salad a ton lately, and I wanted to share it with you. I’m obsessed with it. And once you try it, I think you will be too. 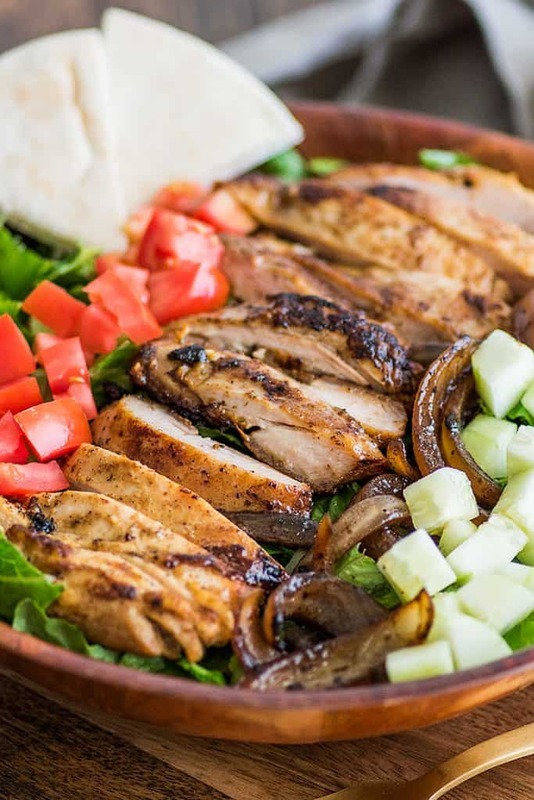 This recipe is my Pinterest-famous (pinned nearly 200k times) Chicken Shawarma recipe turned into a salad, and friends, it is so, so good. If you’re looking for a lighter dinner that is super satisfying and easy to make, you’ve come to the right place. This salad starts with chicken thighs marinated in a mix of olive oil, lemon juice, garlic, and turmeric and then cooked on the stove. After the chicken is done, you cook some red onions in the drippings until they are soft and slightly sweet with caramelized edges. Serve the onions and chicken thighs on crispy romaine with tomatoes and cucumbers, and top with a quick and easy creamy yogurt dressing. The yogurt dressing is just one container of unsweetened yogurt, lemon juice, garlic, and salt and pepper, with just enough milk added to make it a drizzling consistency. It’s a great light and tangy dressing that can be used on tons of different salads. This recipe makes about four servings (though if you really wanted to stretch it, you could probably marinate up to six thighs at a time). It’s fabulous as leftovers, so make it at the beginning of the week and have a salad dinner for a couple of nights, or even better, pack it up for work and make all your coworkers extra jealous with your beautiful meal prepped salads. How cute are these all dressed up as meal prep salads? Wouldn’t it feel good knowing you had a couple of these in your fridge for lunches this week? 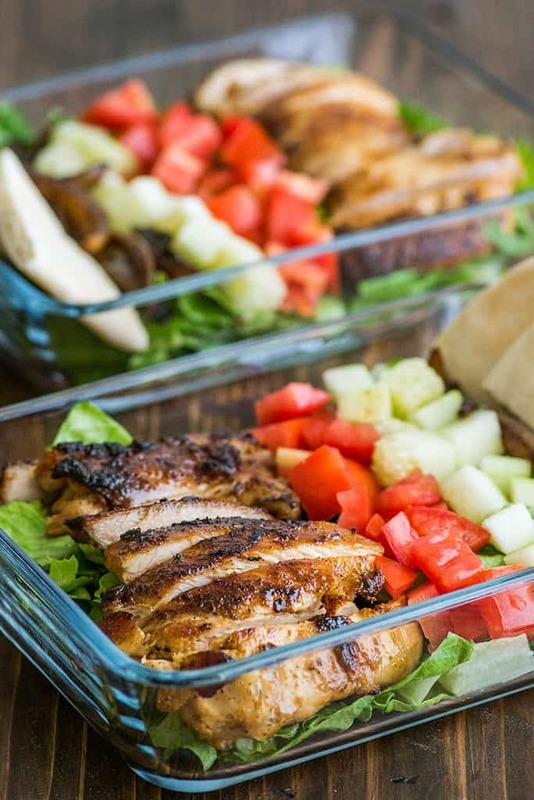 To pack these meal prep shawarma salads, I recommend these 7×5-inch Pyrex containers. They’re sturdy, stackable, dishwasher-safe, and you can bake mini cakes in them when you finish your salad. Add a little airtight container for your dressing, and you’re all set. Salads can be eaten right out of the fridge or transfer your chicken to a plate to reheat before eating. I like to use chicken thighs here because they’re easy to cook and come out tender and juicy every time, but if chicken breasts are all you have, they’ll work too. 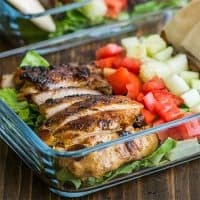 Use the method from my How to Cook Chicken Breasts for Salads and Sandwiches post for best results. For a slightly richer dressing, you can add a bit of (delicious) fat by stirring a heaping spoonful of mayonnaise into the yogurt along with the milk. Finally, if you’re looking for more simple salad recipes, try this Carne Asada Salad, Asian Chicken Salad, and BLT Salad. In a small bowl, whisk together all marinade ingredients. Pour over chicken thighs and toss to coat. 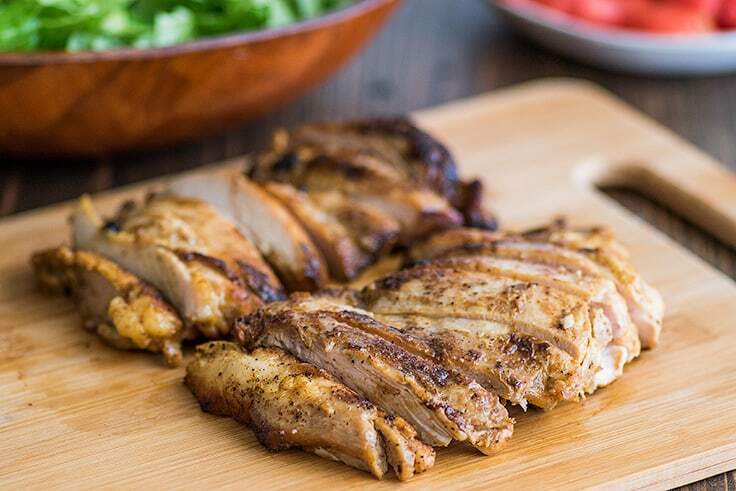 Return chicken to the refrigerator and marinate for 30 minutes, up to 2 hours. Combine yogurt, lemon juice, garlic, 1 teaspoon of milk, and salt. If desired, add more milk by the 1/2 teaspoon until dressing reaches your desired consistency. Add more salt and pepper to taste. On the stove, heat a large skillet over medium-high heat. Once hot, add chicken thighs and cook for 2 to 5 minutes per side, until the internal temperature reaches 165°F. If at any time the outside of the chicken begins to cook too quickly and burn, turn the heat down. Transfer chicken to a plate and cover with foil to keep warm. Deglaze the pan over medium-high heat with 1/4 cup of water or chicken broth, scraping all the crispy browned bits from the bottom of the pan, and add the onions. Cook onions until they reach your preferred level of doneness, 2 to 4 minutes. Slice the chicken and assemble salad. Top with dressing and enjoy! Approximate nutritional information assumes 25% marinade consumption. Love your small recipes! Please keep them coming, especially Indian, Greek and Chinese! Thank you. Love your salad recipes! They have become our new go-to dinners. I took the garlic chicken from garlic chicken cobb salad to a potluck salad bar and received rave reviews! Thank you, Miriam! That makes me SO happy to hear! !